"Mexican President Felipe Calderon and the corporate media "use and abuse the word 'violence'" for their own means. "They say they condemn violence, but in reality they condemn action." Marcos accuses Calderon of using the drug war to pacify discontent with his government. "Mr. Calderon decided that, instead of bread and circuses, he would give the people blood." Marcos also verbalized the common suspicion that Calderon is using the military he's deployed around the country to support his preferred cartel while squashing the competition. Without mentioning specific cartels (Marcos always kept his drug violence criticism aimed squarely at the government), Marcos said, "Calderon decided, supported by one group of drug traffickers, to wage war on the opposing group of drug traffickers. Violating the Constitution, he deployed the military to carry out the duties of the police, the district attorney, the judge, the jailer, and executer." The drug war violence has certainly been well publicized in the the U.S., but it has been left unclear what the true role of the national government of Mexico has been. This article and the comments by Marcos may shed some light on what is actually happening on the ground. 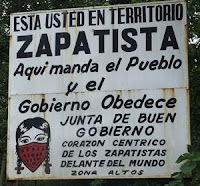 Click here for another interesting (if not long) piece on the Zapatistas and the Gathering. i didn't realize that the zapatistas did not before comment on the drug war. is there a reason for this? good question - I'm not totally sure if they've released statements on the drug war or not, although I kind of feel like they have. Children of the Left, Unite!